how much should a 12" leopard tortoise weigh and how do you know if they are getting enough to eat when they are grazing on grass or should they be supplemented with other food. A healthy tortoise should weigh more than you expect when you pick it up. I have two leopard tortoises as well,and yes while they do love to graze on grass they do need other supplements, I grow many types of lettuces, add a spring mix lettuce, they love occasional corn cut off the cob,romaine lettuce, and cuttle bone for calcium. Limit any protein, in will deform their shells. This is for most Tortoises except Red Foots, and a few other Species. Size does not always delegate weight, if they look healthy, (clear eyes and nose) firm stool droppings they are doing well, make sure their are no soft spots on their shells. Make sure they have access to water to soak in. Should be shallow but clean on a daily basis. 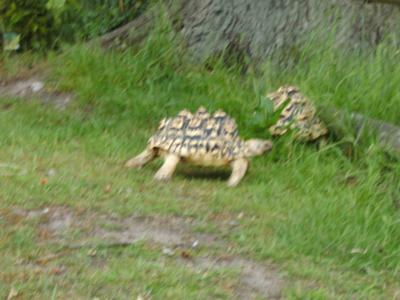 Enjoy them they are truly delightful and wonderful tortoises! Google for additional foods for Leopards.